Contact Sarah at Dwr Y Felin Log Cabins on 07515433787 (mobile: 07515433787) or complete the enquiry form. "Much better than the holiday abroad we were going to book!" "A shining example to other holiday homes"
"Same week-a different year and it just gets better and better"
If you are looking for a Log Cabin with a difference, then a stay in one of our three traditional Scandinavian log houses is for you. Recommended in The Guardian as "one of Britain's cutest Log Cabins with a smart, boutique-y feel"
Stylish, contemporary interiors combine with traditional log home features in this comfortable home from home accommodation in a tranquil setting. Where else can you gaze up at the stars while relaxing in your Hot Tub far away from light pollution. Ideal for a romantic getaway, a luxury family holiday or that reunion with family and friends you have been waiting for. Furnished to a very high standard with a superbly appointed open plan kitchen and dining area where you can indulge your passion for cooking. The three bedrooms with quality bedlinen and three shower rooms, two of which are ensuite, allow plenty of space for that family gathering. A cosy mezzanine area perfect for snuggling together while watching your favourite film. The balcony lends itself perfectly to a Sunday morning of coffee and croissants. Each Log Cabin and their surroundings are perfect for couples wanting that extra special "getaway from it all" feeling, and for parents who want to bring their chidren to the country, where you can all walk along the stream through woodland, spot dragonflies, birds and flowers. 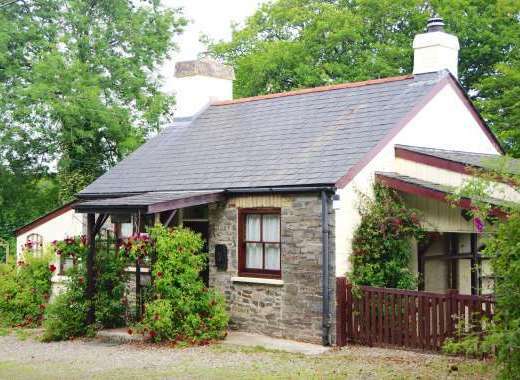 Whatever your holiday requirements, Dwr Y Felin Log Cabins is where you will find it all. All Log Cabins have eco-friendly features including solar panels and ground source heating. Recline on the lounger on the patio and enjoy the evening birdsong after your barbecue with the children playing on the lawn. These Log Cabins are on our working farm, and you will be met and given a warm welcome by Hugh and Sarah upon your arrival, and throughout your stay. A great base for exploring Mid Wales, whether it's sailing, shooting, fishing, quad biking, mountain biking, walking, shopping or walking the sandy beaches, it is all a short distance away from your doorstep. Our log cabins are called Ty Afal (Apple House), Ty Ceirios (Cherry House) and Ty Peren (Pear House). Dwr Y Felin translates as The Mill Water. The stream runs through the land, under the stone bridge and meanders down to the village where it used to supply water for the Mill wheel. Only a five minute walk from your Cabin takes you into the center of Carno where you will find the local Spar shop selling newspapers/groceries plus locally sourced food, and the local tavern that serves freshly prepared meals on a daily basis both lunch time and evenings. Your Log Cabin will be ready for your arrival between 4pm and 6pm. You will find the beds made up, towels provided and a complimentary Welsh Welcome pack. Dwr Y Felin Log Cabins are attractive, eco friendly, luxury holiday accommodation on a working farm. Furnished to a very high standard with a Hot Tub, these luxury holiday Cabins make a perfect get away for couples and families to enjoy a country break. The quiet and comfortable accommodation provides a welcome escape from the hustle and bustle of daily life, deep in the glorious Welsh countryside. Surrounded by farmland, these three Log houses each sleep 6 comfortably. Built from sustainable sourced European yellow pine, with the majority of work done by hand, each Cabin is unique. Their eco friendly commitment begins with carefully sourced timeber, cut during the winter time and extends through every facet of the design, furnishing, under floor heating, water source via a bore hole and solar water heating system. Dwr Y Felin Log Cabins have been sited to take full advantage of the sunlight. Surrounding each Cabin is a carefully planted, naturalistic landscaped area with fruit bearing trees for your enjoyment. There is an abundance of wildlife surrounding each Cabin from squirrels, red kites, buzzards to rabbits, foxes and badgers. We ask for 50% deposit payable within 3-5 days of booking with remaining balance due six weeks prior to arrival date. No reminder sent. If holiday is within six weeks of the booking, we ask for full payment. Annual Events: Carno village Country Show 3rd Saturday in August. Farmers Markets held throughout the year in nearby villages. Please visit http://www.dwryfelin.co.uk to find out more about the holiday cottage, amenities, surrounding area and places to visit in Powys.